The current fashion for rolling back the state has seen the nonprofit or third sector playing an increasing role in what were previously the heartlands of the public sphere. The growing significance of the sector and its increasing reliance on public funds mean it has also attracted increased scrutiny. From outside the sector concerns have been raised about the accountability and performance of nonprofit organizations. From within the sector there has been considerable debate about whether the increased reliance on government contracts is in danger of undermining the sector’s independence. As a result the spotlight has fallen on governance arrangements and whether they are adequate to ensure that nonprofit organizations are effective and accountable for their actions, and able to retain their independence. This collection offers a comprehensive assessment of research on the governance of nonprofit organizations. Nonprofit governance research has been dominated by the study of boards of unitary organizations and has paid insufficient attention to the multi-level nature of governance, governance relationships and dynamics, and the contribution of actors other than board members, to governance processes. 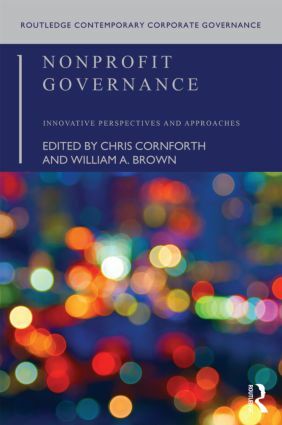 Drawing on the research of leading scholars in the US, UK, Canada and Australia, this book presents new perspectives on non-profit governance, which help to overcome these weaknesses. Written in an accessible manner the book will be of value to scholars, researchers, students, reflective practitioners and governance consultants and advisers.